This is a ‘one of its kind’ festschrift book for Professor Christie Jayaratnam Eliezer (hereafter CJE), the foremost Ceylonese mathematician-scientist of the 20th century. The author Mary Jeevaranee [Ranee] Eliezer nee Handy was the wife of the professor. Between its hardbound covers, the coffee-table size book (27 x 21 cm) packs 482 pages – replete with photographs, family genealogy, some research papers, reprints of conference papers, newspaper clippings, letters, texts of delivered lectures, inaugural addresses, valedictory address and a toast speech to Oxford, memoranda to commissions, 1980 (honorary Doctor of Science degree by University of Jaffna) presentation speech draft of Prof. S.Vithiananthan, obituaries, eulogies, tributes and other assorted materials. Though the text material is predominantly in English, a few tributes in poetry and prose appear in the Tamil language as well. The book is aptly dedicated to CJE’s parents – Elizabeth Ponnamma and Jacob Richard Eliezer – who died too early to enjoy the praise and glory of their son. What is noteworthy is that the author-compiler Ranee Eliezer celebrated her 90th birthday on March 16, 2012. As the inside cover blurb indicates, she had begun this book immediately after CJE’s death in 2001. And it had taken her almost 11 years, of her eighties, to deliver this work to her husband’s memories. This may be a record for authoring a book by an Eelam Tamil lady. What an energetic, vibrant person Ranee Eliezer appears to be. Apart from Dirac and Oppenheimer, thoughts and letters of Hideki Yukawa (1907-1981; 1949 Nobel physics laureate), nuclear physicist Homi J. Bhabha (1909-1966; Director of TATA Institute of Fundamental Research, Bombay), mathematician Marshall Harvey Stone (1903-1989; University of Chicago), philosopher Richard P. McKeon (1900-1985; University of Chicago), Clifford C. Nelson (Columbia University), Ruggero Maria Santilli (Harvard University), Sir Archibald Glenn (Chancellor, La Trobe University) and Michael J. Osborne (Vice Chancellor, La Trobe University) have also been included in this book. For the benefit of those who are interested in challenging their wits with that of CJE’s, the book includes four of his original research papers. The hydrogen atom and the classical theory of radiation. Proceedings of Cambridge Philosphical Society 1943; 39: 173-180. The classical equations of motion of an electron. Mathematical Proceedings of Cambridge Philosophical Society 1946; 42: 278-286. A note on electron theory. Proceedings of Cambridge Philosophical Society, 1949; 46: 199-201. The Australian Roll of Honour (1999) profile on CJE states that he had published 63 papers on mathematics and physics, including books: Concise Vector Analysis (1963), On Statics (1964) and Evolution, Creation or What (1996). In pages 41 to 42 of this book, a complete list of these 63 publications is included. Omitting the above noted 3 books and another text book Mechanics for Year II (1988), co-authored with J.C. Barton, cumulative publications of CJE amounts to 59. For posterity, it is my wish that 50 plus of these CJE papers which had appeared in leading journals such as Nature, American Journal of Physics, Physical Review, Reviews in Modern Physics, Mathematical Gazette, American Mathematical Monthly, Proceedings of the Royal Society of London and Mathematics Magazine deserve to be brought out in a single volume by his admirers. Here is a good news for those who are interested in referring to CJE’s publications. When I checked the JSTOR academic digital archive database (www.jstor.org/) using C.J. Eliezer name, complete texts of 22 of his publications are made available in it for access. “Dr.C.J.Eliezer, who resigned his post as Professor of Mathematics and left for Malaya a few days ago, is perhaps one of two men in the local university who have won authentic recognition outside the country as scholars. (The other, Dr.S.Paranavitana, is not really a Ceylon University man!). 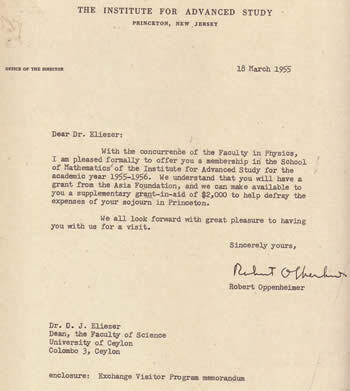 And Eliezer was working in a field, nuclear physics – which is not only vitally important but a field in which we have an embarrassing paucity of scholars. A Cambridge prizeman, an Isaac Newton scholar, the winner of an award made by the American National Academy of Sciences for original work in mathematics, the quite, mild-mannered Eliezer took his academic laurels so smoothly that he was respected by everybody on the campus. 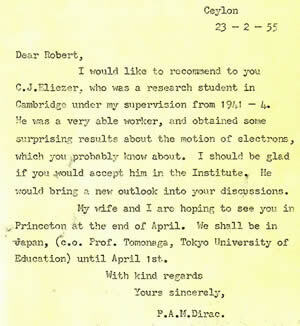 But the man who acted for Dirac in Cambridge and studied under Oppenheimer at Princeton could not persuade the University authorities to grant him a year’s leave to accept the Malayan University’s invitation to set up its Mathematics Department. After spending 10 years, CJE opted to quit from the University of Malaya. 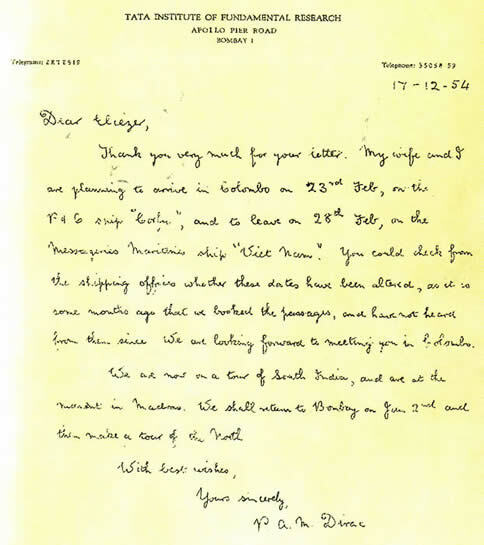 For quitting this position in March 1969, CJE in his letter of resignation to the Vice Chancellor J.H.E.Griffiths (that appear in an undated letter draft in page 279 of the book), cite “family circumstances” that had compelled him “to make a move from here”. CJE ended his letter with the thoughts: “To leave here would be a wrench, for I have been in this University since its infancy. Looking back, I am the only Professor here at present from the original group of Professors that assembled at the first Senate meeting in 1959. As I leave, there is however, the satisfaction that the Mathematics Department is now reasonably well established.” When the First International Tamil Research Conference was held at Kuala Lumpur in April 1966, CJE and his wife lent their hands to the organizers for the success of this conference. CJE also presented a short research paper on Indian Tamil mathematician Srinivasa Ramanujan (1887-1920) at this conference. 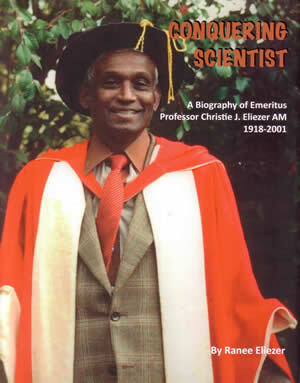 For his trend-setting career as a scientist, educator and social activist for Tamil rights, CJE received numerous awards in the countries where he had lived ‘permanently’ (Ceylon, Malaya and Australia) and temporarily (UK, USA). Not to be omitted was the Maamanithar (Distinguished Person) award [the highest national honour of Tamil Eelam] conferred to him on October 19, 1997, by LTTE’s leader Velupillai Pirabakaran, in recognition of his “patriotic service to the cause of national freedom”. I should note that whereas a couple of mathematicians of mediocre grade such as Rajan Hoole and K. Sritharan sided with the Sinhalese regime in debunking LTTE’s deeds, CJE had the conviction to stand firmly in LTTE’s corner. Usually Maamanithar awards recognized the Tamil individuals who are not among the living. CJE was one of the few, who received recognition by this award, while he was living. Until his death, CJE remained as a pillar of the Australasian Federation of Tamil Associations. If the period photographs featuring CJE, his family members and acquaintances which are displayed appetizingly among the pages, were an asset to the book, I may add that the lack of a good index is a demerit. Complete citations to some of CJE authored features (example: two items appearing between pages 379 to 398) included are missing as well. I guess that this is not intentional, but may be due to oversight. 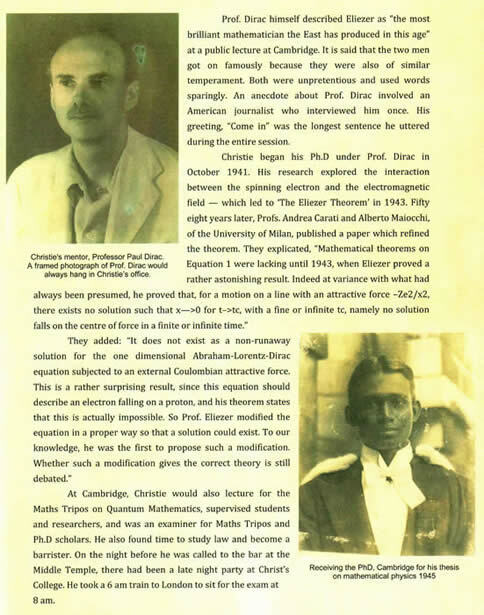 The book includes the original typescript of CJE’s tribute to his mentor Paul Dirac; it did appear in print later, in Tributes to Paul Dirac (1987), edited by J.G.Taylor. I have no hesitation in asserting that CJE’s spirit lives in this worthy compilation. I conclude this review, with a 2,000 year old quote by Hillel the Elder, the Talmudic sage, which was a favorite of CJE. “If I am not for myself, who am I? Those who are interested in receiving a copy, can obtain it by making a donation to 'The Eliezer Charitable Trust’, set up by the author with the hope of supporting a Hartley College student doing mathematics at the Cambridge University - thus possibly following the path of CJE. A donation of 110 Australian dollars (inclusive of air mail postage of 50 Australian dollars) is suggested. Contact person, John Ratnajothy Eliezer. His email links are, either J.Eliezer@bom.gov.au or eliezer1@bigpond.com.